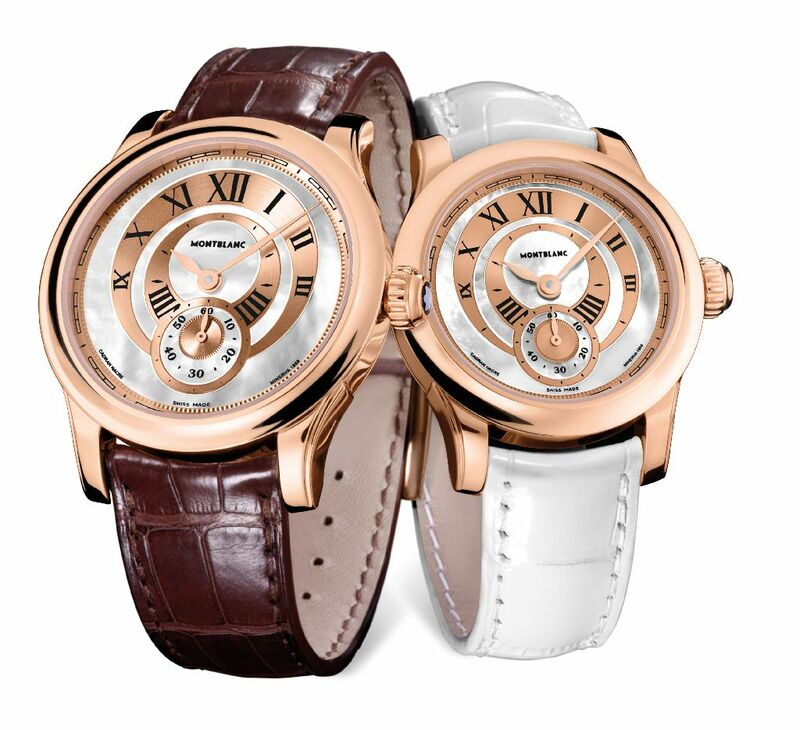 Unveiled along with Montblanc Collection Villeret 1858 – Seconde Authentique models at SIHH 2013, the “Pour Elle & Lui” pair watches expresses togetherness. Like a set of wedding-rings, these two watches share the same look and differ only in their diameters, which measure 36 mm on the lady’s wristwatch and 39.5 on the gent’s model. Calibre MB M62.00 animates both watches and assures that their hearts tick synchronously at a pace of 18,000 semi-oscillations per hour (2.5 Hz). The cases are made of 18 ct red gold 5N: this alloy’s distinctly reddish hue gives it an especially romantic effect and automatically associates it with traditional values. All contours are harmoniously rounded: from the gently arcing horns, through the concave lines of the bezel, to the circular shape of the case. The round dial is embellished with a miniature marquetry artwork crafted from red goldplated inlays and mother-of-pearl. 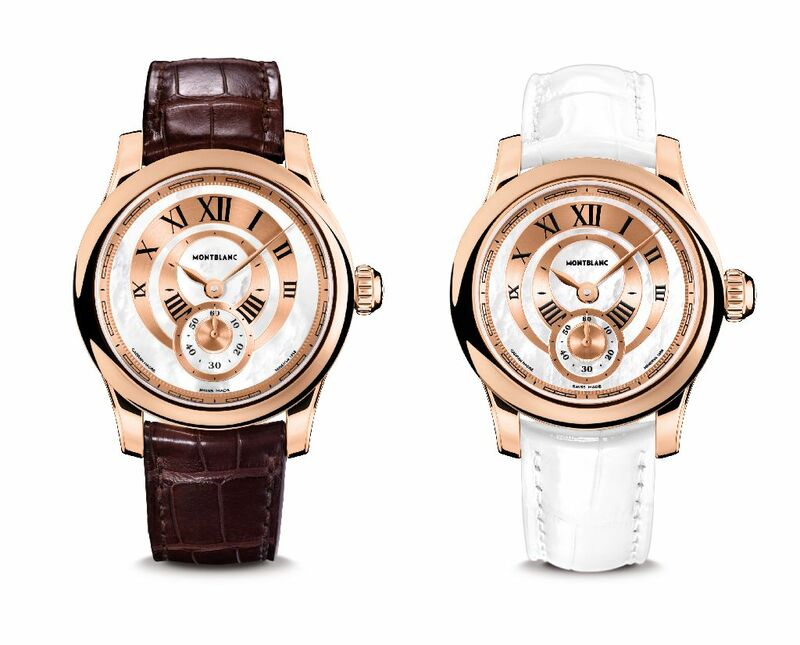 The hour scales are made of a soft red gold tone with black Roman numerals; the same combination is used on the flange (réhaut) with its slender minute indices. White mother-of-pearl intarsias adorn the recesses between these scales as well as the subdial for the seconds at “6 o’clock.” Hands made of 18 ct red gold sweep their arcs above this work of horological art. But as aficionados have come to expect from the watches in the Montblanc Collection Villeret 1858, this is by no means the last of the beautiful details. A pane of sapphire crystal in the screwed red gold back invites connoisseurs to admire the manually-wound calibre MB M62.00. The rear view of this hand-wound mechanical movement clearly reveals why the traditional Swiss art of watchmaking is globally unique. The rhodium-plated nickel-silver bridges are beveled by hand and are manually embellished with Geneva waves (côtes de Genève) which contrast beautifully with gleaming red jewels and a golden screw balance. The large diameter of the balance gives it an ample moment of inertia, while its manually counted hairspring contributes to the stability and regularity of the movement’s rate. Although the other delicacies are visible only to a watchmaker’s eyes, these tidbits reaffirm the extremely high craftsmanly standard upheld at the manufacture in Villeret. The movement’s nickel-silver plate is manually adorned with circular graining on both sides; its flanks are beveled by hand. The wheels are plated with gold and have faceted arms. These elaborate embellishments, which demand great skill and dexterity, transform each of the manufacture’s movements into a little treasure. Every Seconde Authentique “Pour Elle & Lui” wristwatch is a jewel that puts a crowning touch on a cherished relationship. These wristwatches are affixed to hand-sewn dark brown or white alligator-leather straps secured by 18 ct red gold pronged buckles. The Seconde Authentique watches for couples are available only in sets of two, thus making them the perfect gifts for two people who love to spend their time together and enjoy every minute of each other’s company. Strapping the appropriate watches to their wrists is a lovely way to express this togetherness, but only 58 lucky couples around the world will have the rare opportunity to crown their togetherness with a matched pair of Seconde Authentique wristwatches from the Montblanc Collection Villeret 1858.